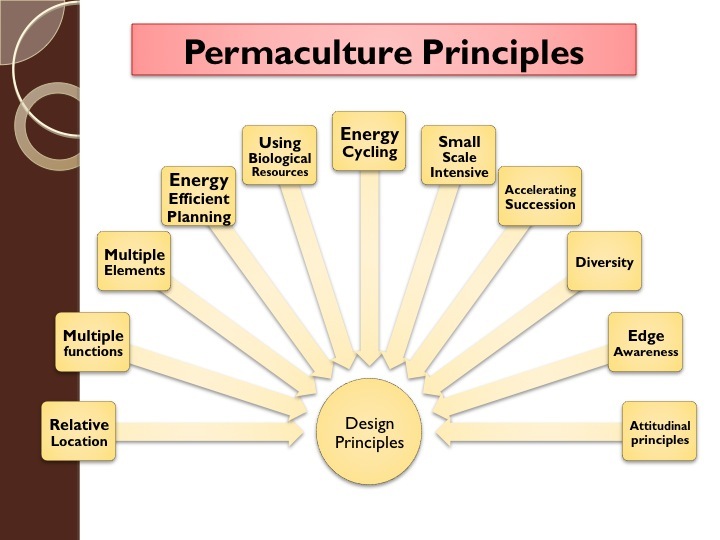 The Permaculture design principles below come from Bill Mollison’s later book “Introduction to Permaculture” which helps to frame this PDC handbook. There he presented a concise form of the principle concepts he laid out in the Chapters 2 & 3 in Permaculture: A Designer’s Manual. He refined the jumbled approach of it into 11 principles with subheadings as to organize the information more efficiently. A summary from our interpretations can be seen below and even downloaded here: BM PC Principles summary. The principles are patterns laid out on how nature’s inherent intelligence is formed in time and space. They are a great tool for interpreting ecosystem establishment and its functions and from there designs can unfold. When we understand ecology, ecological design can flow and take care to not keep making mistakes of BAD DESIGN! This refers to rubber stamp design, design that isn’t context and climate specific, and one that doesn’t take into account say something like the objects next life cycle. When we comprehend nature we can copy it and produce energy efficient and abundant designs. 1. Relative Location: Seek to build working relationships between each element so that the needs of one element are filled by the outputs of another element. 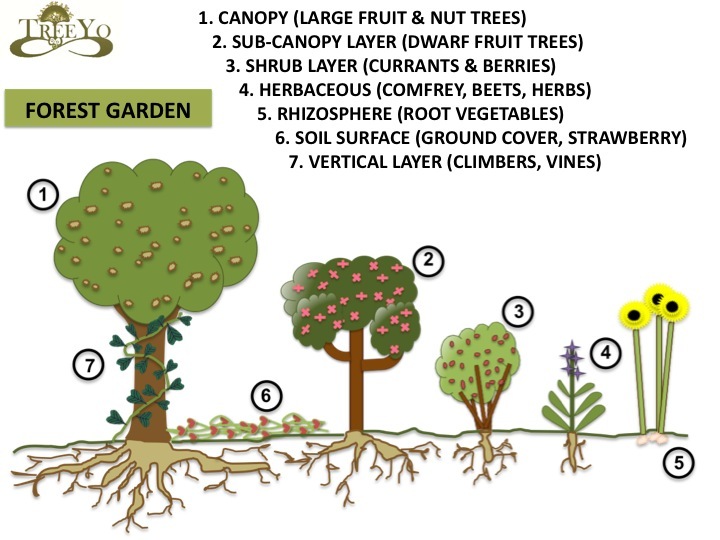 Core of Permaculture is Design; design is a connection between things. To enable a design component to function efficiently, we must put it in the right place. Functional Analysis: is a tool to realize the full potential of each element by examining products and behaviors, needs, and intrinsic characteristics. 2. Each Element Performs Many Functions: Each element in the system should be chosen and placed so that it performs as many functions as possible. Use relative location so elements with diverse functions have their qualities perpetuated. 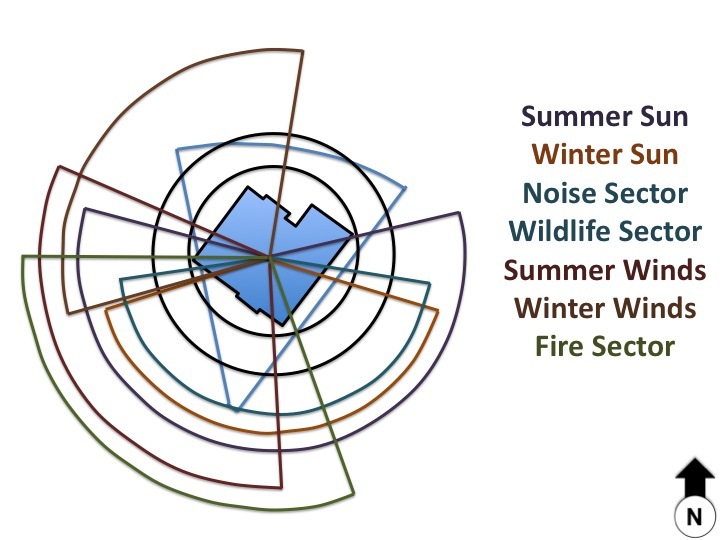 Sector Planning is about placing design components to manage incoming wild energies to our advantage or to mitigate their affects. 5. Using Biological Resources: Is the key strategy to develop sustainable systems, save energy and do the work of the farm. Their building up on location is a long-term investment, they have to be managed carefully, and their integration needs to be thoroughly considered in the planning period and during their usage careful management and adherence to proper timing is essential. Animal Tractors: use animals to clear land, such as chickens in the garden, goats on a bramble patch, or pigs to help turn over a potato field. 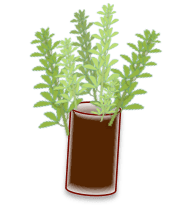 Pest Control: integrate specific plants to create refuges for beneficial insects such as those from the plant families of aster, umbel, and mint. 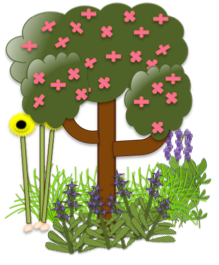 Additionally design in bird and bat houses, small ponds, rock and stick piles as well as large hollow logs to create habitat for various species such as small reptiles. Fertilizers: use the manure from animals to create soil as well as diverse plantings that include nitrogen fixing plants (alfalfa, clover, black locust) as well as dynamic accumulators (comfrey, nettles) so that chop and drop can be employed. off-site and instead turn them into cycles. The interaction between plants and animals produces energy, which is caught, stored, used and re-cycled. Incoming energy –sun, water, wind, manures– are used at its highest possible use, then its next highest, and so on. “Source to sink”: moving water across the landscape in a series of interlinking ponds to prevent erosive runoff. Cascading nutrients: turning the waste of one product into a multitude of other products using various life kingdoms- i.e. plants, animals, bacteria, and fungus. Kitchen wastes to compost, animal manure to biogas, greywater to the garden, etc. 7. Small Scale Intensive Systems: Fully develop the nucleus before moving on, planning for highly intensive, biologically based food, fiber, and energy production at the doorstep. Time Stacking: in combination with the above, utilize species that provide yields early, thus gaining quick rewards from the intensive energy input of developing a space for a long term yield such as avocado’s or macadamia’s. 8. Accelerate Succession and Evolution: direct plants, animals, and soil life towards complexity and diversity to build our own climax species in a shorter time, forward your agriculture systems to more permanence, whether it is a grassland or a food forest. Utilize invasive species to your advantage; substitute your own pioneers and climax species that have multiple functions. Guilds: are close associations of species around a central element. Rely on composition and placement of species, which benefit each other. They aid in reducing root competition, providing physical shelter, providing nutrients, and assisting in pest control. Problem is the Solution: every resource is either an advantage or disadvantage, depending on the use made of it. The Yield is Theoretically Unlimited: the only limit to the number of uses of a resource within a system is only limited to the information and imagination of the designer. Work with Nature, Not Against: We need to assist rather than impede natural processes, essential to comprehend and copy. Everything Gardens: every creature sets up conditions so that it can thrive. They create and carve their niche in an interconnected web of life. Least Change for the Greatest Effect: When designing, use our intuition to guide the inherent regenerative qualities so that energy is not squandered. Hi …. this is great stuff. I have a small farm in tropical Africa so many of the plants are different, but the principles remain the same all over the world.